~ Enhancing Imagination, Innovation, & Creativity. It was one of the last old-school sci-fi flicks before “Star Wars” oft overlooked by today’s audiences because it lacked the zowie FX, soundtrack, and comic book plots that became mainstream by the end of the Seventies. But it had some dazzling Sixties psychedelyic lighting, the cool hipster Michael York, many lovely ladies in very short skirts, and introduced the big hair beauty, Farrah Fawett before she was in the Majors. Weinberg, who now resides in Chicago and works for the Environmental Health Fund on international pollution issues, remains an activist to this day. “I told him (the reporter) we had a saying in the movement that we don’t trust anybody over 30. It was a way of telling the guy to back off, that nobody was pulling our strings.” The San Francisco Chronicle zeroed in on the quote and it went viral (on paper) as dozens of papers and synidicates picked it up. So the movie is about a future society where you are of no value after the age of 29. You and your birth cohorts are eliminated. Pink slipped with extreme prejudice. Terminated. Ironic that my generation defined one of the biggest “invisible” social issues in America, and that being age discrimination. Full transparency here. I was forced out of a major international non-profit after being targeted by a much younger competitor who wanted my department, my staff, my creative responsibilities — but most of all, my power, prestige, and position. But I’m not bitter much. Said SIL did his job well, receiving promotions, salary increases, bonuses, awards. All the debris we accumulate during our ascending the corporate ladder. However, and there is always a however in life, at his recent ten-year anniversary party several of the senior veeps in attendance brought the buzz-kill to the celebration when they proclaimed loudly over imported guava-infused vodka that they had never attended a ten-year anniversary ever before. Most recently I have had the opportunity to get up close and personal with Amazon. I truly admire their absolute dedication — no, obsession — with customer experience. Their Leadership Principles are outstanding in most ways and if you are an Amazon customer, they truly make your experience a valued one. But, you can feel it when you visit. You can feel the urgent ascendancy of youth among their managers, directors, and other leadership. Most of their management staff are umbilically entangled with data; they pace from hither and yon with one hand clutching a laptop while the other reacts to emails, data dumps, and other digital crunches. Few over 50 would tolerate such a culture. But jobs, good jobs, are a scarcity in America today. If you are experienced, talented, motivated, loyal, yet over the threshold of 55 and unemployed your odds of returning to a responsible position in management is as rare as finding a pearl at Joe’s Crab Shack. Actually, you will probably find your next job as a harried aging floor manager at Joe’s, or Applebee’s, or Ruby Tuesdays. But let’s return to our uber-tech workplace. Life may begin at 50 elsewhere, but in the tech biz the only thing certain about middle age is unemployment. The tone is set by the industry’s top CEOs. “When Mark Zuckerberg was 22, he said five words that might haunt him forever. ‘Younger people are just smarter,’ the Facebook wunderkind told his audience at a Y Combinator event at Stanford University in 2007. If the merits of youth were celebrated in Silicon Valley at the time, they have become even more enshrined since,” Alison Griswold writes in Slate. A 2013 BuzzFeed piece titled “What It’s Like Being The Oldest BuzzFeed Employee” (subhead: “I am so, so lost, every workday.”) by a 53-year-old BuzzFeed editor “old enough to be the father of nearly every other editorial employee” (average age: late 20s) reads like a repentant landlord-class sandwich-board confession during China’s Cultural Revolution: “These whiz-kids completely baffle me, daily. I am in a constant state of bafflement at BF HQ. In fact, I’ve never been more confused, day-in and day-out, in my life.” It’s the most pathetic attempt at self-deprecation I’ve read since the transcripts of Stalin’s show trials. A few months later, the dude got fired by his boss (15 years younger): “This is just not working out, your stuff. Let’s just say, it’s creative differences. PS. 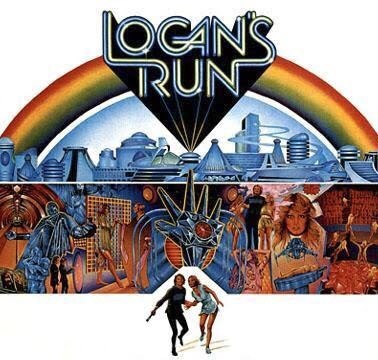 Hollywood is evidently working on a remake of Logan’s Run. Wonder how old the protangonist will be in this new flick? Douglas Arnold’s upcoming book, “Ingenuity!” will be out later this year. Follow this blog and you may qualify for a free copy upon publication. Arnold, The Ingenuity Guru, is a writer, workshop leader, and speaker on ingenuity, imagination, and creativity. His upcoming book focuses on sparking greater innovation in the workplace and community. His weekly tweets, blogposts, and podcasts inform and entertain. You are invited to follow this blog and on Twitter @DouglasArnold. Recognition to Mr. Ted Rall, a nationally syndicated editorial cartoonist, writer and occasional war correspondent best known for his coverage of Afghanistan, Pakistan and Central Asia. A Pulitzer finalist and twice the winner of the RFK Journalism Award, Ted is the author of 17 books including “Revenge of the Latchkey Kids,” about Gen Xers, “To Afghanistan and Back,” the noted comix journalism work, and, most recently, “After We Kill You, We Will Welcome You As Honored Guests: Unembedded in Afghanistan” (Farrar, Straus & Giroux). He is working on a biography of Edward Snowden.